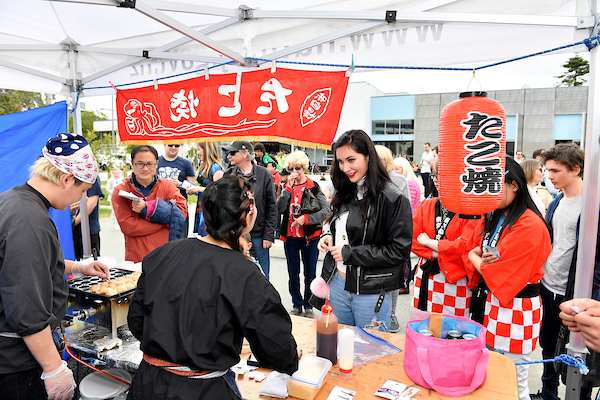 The Hutt Japan Day 2017 was scheduled on the same day as the Toast Martinborough festival, which limited options for numerous food trucks however we were extremely grateful to the following providers who were busy all day providing Japanese street food and other Asian delicacies: GOGO Takoyaki; Matsuda Shouten Japanese food truck; Mao & Co Homemade Noodles & Dumplings; Onebites Indonesian Foodtruck; JETAA Wellington & their Taiyaki machine. Inside the Dowse Art Museum was a mini-market with Japanese stalls promoting their services or selling their wares to the public. These included: Air New Zealand; Kusadama Creations; Saisei- Upcycled Japanese Vintage; FineLine Press; EcloArt By Emy Oikawa; Wrap16; Neko Japanese handicrafts; Japan Information and Cultural Centre, Embassy of Japan in NZ; Japan Society of Wellington; Sister Cities New Zealand; Wellington Omotesenke Tea Ceremony Club; Council of Local Authorities for International Relations (CLAIR); Hutt Minoh House Friendship Trust. Throughout the day visitors were entertained by a wide variety of martial arts groups from the Hutt valley region. These included: Kyudo Wellington (Japanese Archery); Hutt City Aikido; Wellington Region Karate Academy; Yoshinkan Kendo; Wellington Iaido and Wellington Naginata. There were two stages on the day, both inside the Dowse Art Museum and outside. The inside stage was for Japanese cultural music and dance performances. 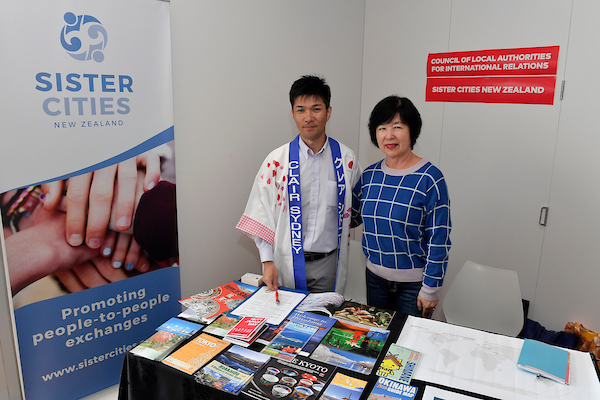 These included: Na-Na-Mi Trio; "Genki Kids" choir from the Wellington Japanese Supplementary school; Koten Dance Group; the Upper Hutt Kizuna project. As well as three different Taiko groups: Narukami Taiko group, who also ran a successful workshop for our festival and opened our proceedings; Taikoza Wellington, who concluded our event for us and Mukume Taiko group, who played in the middle part of the day. The biggest prize of the day was the opportunity to win a trip for two to Osaka, generously provided by Air New Zealand. Festival goers were encouraged to take a selfie photo with Minoh-shi's mascot Yuzuru and upload it to social media with the hashtag #huttjapanday. Those who didn't have social media accounts were entered into the competition by the Amazing Travelling Photo Booth who were on-site all day. (Check out our Gallery page) Our winner was drawn from all the entries a few days later on our Facebook page.